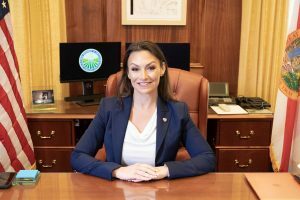 Florida Agriculture Commissioner Nikki Fried believes state legislators are ready to embrace hemp. Florida’s farmers are hopeful that hemp will become legal in the state in time to plant this year. The idea also is gaining popularity among lawmakers, with hemp legislation making its way through the Florida state Senate and House. Farmers need a lifeline, and hemp is it, Florida Agriculture Commissioner Nikki Fried told Hemp Industry Daily. In addition to Hurricane Michael, which caused significant farm destruction in the Florida panhandle, farmers are dealing with citrus greening – an issue that has all but wiped out the state’s largest crop. Florida authorized hemp research in 2017 but has not yet seen a commercial industry emerge. Fried said the political temperature in the state is warming to hemp expansion. “Our state is ready to get behind it, and it’s ripe to pass legislation this year,” she said. The Senate version of the bill would give the Department of Agriculture and Consumer Services 90 days to have a plan in place. “My legal department has already started to craft the rules,” Fried said. A strong proponent of cannabis, Fried campaigned for office on creating a Florida hemp program, as well as expanding the state’s medical marijuana program. She traveled to Washington DC twice recently, working with the U.S. Department of Agriculture (USDA) and the U.S. Food and Drug Administration (FDA). “I have been really pushing our Legislature here to move as fast as possible, to make sure that we have our own framework here in our state,” Fried said. But she also warned that too much rulemaking by the USDA could stifle the industry. “This is an opportunity for the U.S. to create American-made products and be a leader in exports for this industry,” Fried said, “not only for the human side but also for the industrial side. She will be looking to the USDA for provisions for seed certification, crop insurance and banking in 2020. During her run for office, Fried saw her campaign bank accounts closed by Wells Fargo and BB&T because she was a cannabis advocate who received contributions from the industry. “Whether it’s passing a fair banking act or passing a state’s right act, it’s time for the (federal) government to step up and get out of the way of this legal industry that’s throughout our country,” Fried said. The state of Florida made international headlines in February when Fried appointed Holly Bell as the state cannabis director within the agriculture department to oversee medical marijuana and hemp. Fried said she wouldn’t be surprised if more states implemented the same type of position as hemp and marijuana legalization continues to move forward. Setting up a successful hemp industry in Florida doesn’t stop with cultivation – farmers need to have a market to sell their products to, Fried said. Fried said Florida “can’t wait three years” for the FDA to create regulations for CBD. “My concerns are that if they keep moving the ball down the court and don’t get on top of this sooner rather than later, then it becomes a big mess trying to regulate it years down the line,” Fried said.